Much of the feedback I received for my “Rise of the Year” article related to the omission of Golovkin and how this was supposedly disrespecting the heavy-handed Kazak. It’s not… it’s actually a mark of how much respect I have for the man and what I expect from him. 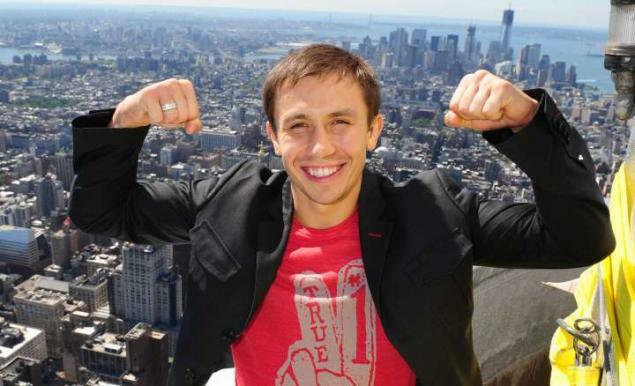 Golovkin came into 2013 as a man with huge power and a great amateur background but questions over how he would perform against the very best in the division. He leaves 2013 as a man with huge power and a great amateur background but questions over how he will perform when he finally takes on the very best in the division… questions he fuels himself by talking about how he’d face Mayweather at 154lbs or Andre Ward at 168lbs while actually taking on Curtis Stevens. And that’s why I see Golovkin treading water this year. His regular bouts and HBO exposure have done his bank balance and visibility some good and he’s produced some thrilling stoppages but in terms of his opponents? Natural 154lbs contender Gabriel Rosado, semi-retired gatekeeper Nobuhiro Ishida (coming off two losses) and the aformentioned HBO hypejob Stevens are not a great list of opponents for someone with Golovkin’s skills or reputation. Matthew Macklin was the best of the bunch and at least represented someone close to the top of the division… but he was there largely because he looked fairly good in losing to Sturm and Martinez. Golovkin was always going to beat Macklin… especially a Buddy “If in doubt pick the guy not trained by” McGirt trained Macklin and while his one-punch body shot knockout was certainly impressive it was not unexpected. And that’s part of it. Golovkin was the prohibitive favourite in all of those bouts and for good reason. We know how good he is against that level of opposition… he demonstrated it by flattening the likes of Proksa, Simon, Ouma, Anderson, Mamani and Dziarra. What we want to know is how he’ll do when he steps up to the next level… and he didn’t do that in 2013. I have some sympathy with the fact injuries and reluctant opponents mean he can’t always get those bouts and I like the way he keeps himself busy… but the fact he’s scheduled his first contest of 2014 to be against fringe contender (and that’s being generous) Osumanu Adama means it will be a while longer still before we see an improvement in opposition. In addition, Martinez’s reputation has taken a bit of a kicking over the year. For a man who made a large fuss about Chavez Jr’s reluctance to face him he own (or at least his management and promoter’s) reticence about making a match with the previously mentioned Golovkin does rankle somewhat. It hasn’t been an awful year; Martinez is after all still the RING and TBRB 160lbs champion, still generally ranked fairly highly on pound for pound lists and it looks like a much discussed bout against a rejuvenated Miguel Cotto is highly likely for next year… but it’s not been a year Martinez will look back at with any real fondness. The only thing that can hold the ultra-talented 168lbs ruler’s career back is himself and his team… and they’ve been excellent at doing it. No-one can doubt Ward’s technique or natural ability inside the boxing ring. He was masterful in taking apart Edwin Rodriguez with a near perfect performance against an awkward opponent who was on a great run of form… and that win may or may not have made him the lineal 175lbs champion (it’s complicated even by boxing’s standards featuring disputed retirements and missed weights). The issue is that the bout with Rodriguez was Ward’s only appearance in the ring this year (and his only appearance for more than a year). Instead of boxing, Ward has spent most of the year in an ugly contract dispute with his promoter Dan Goosen, losing an arbitration hearing earlier in the year and now ending it by suing him again. It’s always disappointing to see boxers kept out of the ring by promotional issues… but when those issues are driven by the boxer in question it becomes even more so. Ward has been in a difficult position at 168lbs ever since winning the Super Six tournament largely because he is so much better than the other boxers there. The only man who seemed to bring some intrigue was Lucian Bute… and he was flattened by Carl Froch before moving to 175lbs. Ward’s victory over Froch in the finas of the Super Six was so comprehensie that it’s hard to get excited by a rematch (likewise for a rematch with Mikkel Kessler… who also lost to Froch this year) and the rest of the 168lbs division hasn’t quite sparked into life. The fact that when most people think of the bouts they want to see Ward is they think of either the above mentioned Golovkin or Stevenson and Kovalev (both contenders for Rise of the Year) at 175lbs shows that. Ward needs to do something with himself in 2014. It would be a waste of his talent not to. Most of us know the basics of the Deontay Wilder story. He walked into the US Olympic Team despite very little amateur experience and walked out with a bronze medal at the Olympics. Athletic and powerful (having stopped every opponent), he’s the great hope for the US heavyweight division. The concern is who those opponents he’s stopped have been. 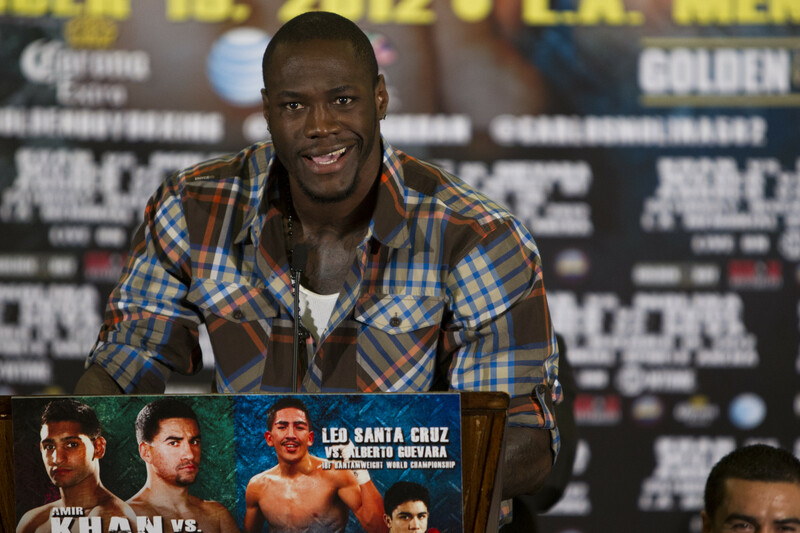 Some leeway could be given to Wilder early in his career. After-all, with so little amateur experience and history of boxing he needed more time then most and so we could accept substandard opponents as a learning experience and to keep him sharp while he worked in the gym. Likewise, when you add in that he’s been knocking out people in a couple of rounds he needed ring time to develop. But it’s starting to get silly now; Wilder is 28 years old and 30-0 having been a professional boxer for five years. It’s time to stop handling him with kid gloves and start giving him real opposition. To be fair, 2013 did see a slight increase in his opposition… but only slight and the fact the best fighter he faced is arguably Audley Harrison it tells it’s own story. Matthew Greer is a punching bag brought in to give contenders and prospects a knockout win, Harrison is essentially a joke, Siarhei Liakhovich is shot, a shell of what he used to be in 2006 and was coming off two stoppage losses and Nicolai Firtha is a journeyman who much like Greer is largely brought in to give contenders wins. Unlike Golovkin who can at least point to opponents being reluctant to face him, it’s generally been Wilder who’s turned down bouts from more established boxers. He infamously called out fellow US prospect Bryant Jennings in September 2012… but when Jennings responded and sent him a contract to sign Deontay turned tail and ran, proclaiming that he was moving on to bigger and better things (the aforementioned Greer…). His team also turned down the chance to face Tyson Fury when the Haye bout was first postponed… although that was admittedly at short notice. Wilder’s kept winning and kept knocking opponents out… hell, he’s managed to get himself ranked three by the WBC and with Stiverne and Arreola rematching for the vacant title he’ll likely get a title shot next year… but he’s still yet to face a respectable opponent for someone with his talent and reputation. Which is where he was last year. Pretty much since turning pro we’ve been told that Brook is a special talent and one we should keep an eye on. Since beating Michael Jennings in 2010 in a WBO eliminator we’ve been told that Brook was right on the verge of a title shot and that his time was coming soon. And here we are at the end of 2013 and it turns out his time is still coming “soon”. Brook’s be unfortunate in some ways. This year was meant to be the year he finally boxed for a world title having narrowly scraped past the limited Carson Jones (in a bout I thought he lost) to become mandatory contender for the IBF belt in mid 2012, but injuries to himself and the then champion Devon Alexander kept delaying the bout until it was finally cancelled. 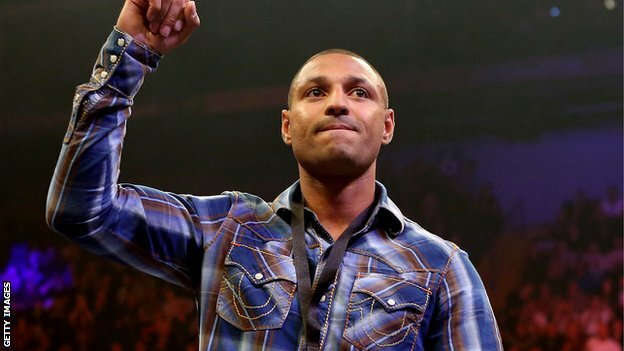 Being fair, he did look impressive in his two bouts this year, easily beating Jones in a rematch and then vanquishing Hatton conqueror Vyacheslav Senchenko in four one-sided rounds, but those are the sort of guys Brook should be beating easily if he’s anywhere near as good as he likes to say he is. Barring injury Brook should finally get that title shot next year, this time taking on Rise of the Year contender Shawn Porter. But we’ve been here and said that before. Talented as Brook is he and his team have kept him coasting for far too long… and this year is a great example of that. His fault or not, whatever the reason, it’s somewhat hard to keep talking about a world title bout and not have a world title bout without it reflecting badly on the people involved. People won’t necessarily admit it now, but for a while people thought “The Nordic Nightmare” was going to be the man to truly challenge the dominance of the Brother’s K at the top of the division. Tall, rangey and powerful with a good jab and a strong counter right hand, as 2011 came to a close Helenius looked to be in great form, knocking out fairly decent opposition with ease. All he had to do was get through British contender Dereck Chisora… a man who only months before had been dominated by Tyson Fury… to really cement his place. Well, technically, Helenius did get past Chisora… but for almost every observor it was a clear and egracious hometown decision that went in his favour. Then news came out that he’d badly injured his shoulder during the bout and, in all honesty, that’s basically the last we heard from him. I was willing to give Helenius a bit of a pass for his 2012 campaign where he boxed only once, easily outpointing the well-travelled Sherman Williams. He had to recover from shoulder surgery after all and then get back to fighting shape. But surely 2013 was the time to reassert himself as a big name at heavyweight? Instead he again boxed only once, outpointing Michael Sprott in a yawn inducing contest that consisted largely of Sprott waddling forward ineffectually while Helenius tapped him with his jab. Helenius has never been the most active boxer and tends to wait for an opponent to present an opportunity rather than actively try to create them himself but even by his lax standards he’s been remarkably reluctant to throw his right hand and I suspect that shoulder injury may be lingering. That said, his camp say he’s OK and so for the moment I have to take them at their word. 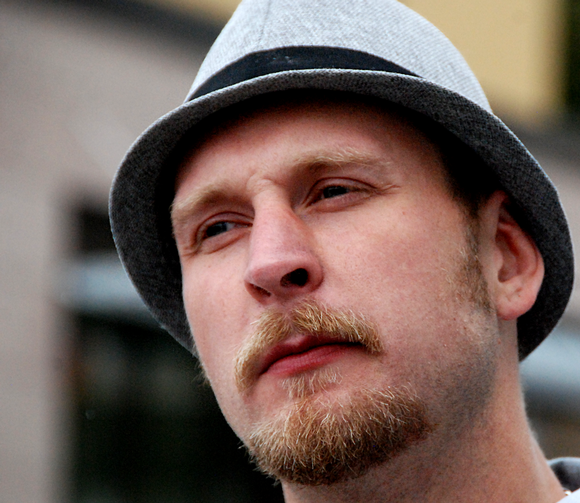 It’s not all been bad for Helenius. He is after all still (technically) undefeated, still ranked top 10 by both the IBF and WBO and still well positioned to make a run towards a title shot if he’d be more active. But Helenius has stood still while others in the division have made up ground and he’s been completely unable to return to being the premier contender, instead just being one of the pack. Omar Andres Narvaez: Still the WBO super flyweight world title holder? Check. 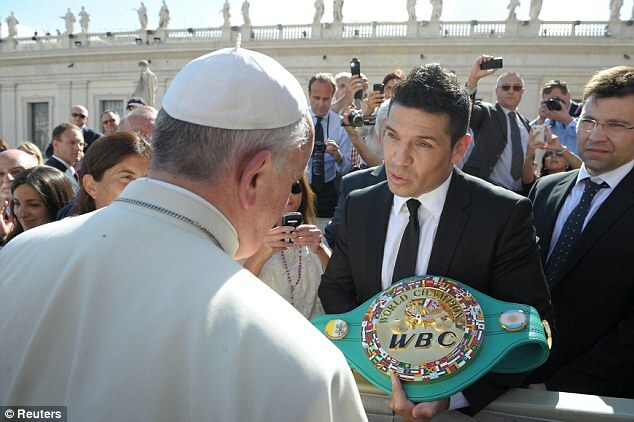 Still only really boxing in Argentina? Check. Still not facing anyone you’ve really heard of (outside of that time he came to the US in 2011 and was outclassed by Donaire)? Check. Tyson Fury: Unfortunately for Fury a star making bout with David Haye was postponed and then cancelled. That leaves the loudly spoken heavyweight having only boxed once in 2013; a sloppy bout with a faded and undersized Steve Cunningham where both men were knocked down that showed all of the bad and only some of the good about Fury. Peter Quillin: Athletic and powerful, Quillin ended 2012 by becoming a title holder but facing the likes of Rosado and Fernando Guerrero doesn’t move his reputation or career forward in any way. Billy Joe Saunders: A talented amateur, Saunders spent the whole year boxing at British level. He’s better then that and we know it. Andre Dirrell: He boxed for the first time since 2011 (and only the second time since early 2010) and he won so I guess that’s good but Dirrell has far too much talent (if not the mental strength) to be content with his lone bout being winning a wide decision against a 16-6 opponent who had never beaten someone with a winning record. Dirrell is 30 now and watching his prime flash him by… he needs to box and box often. 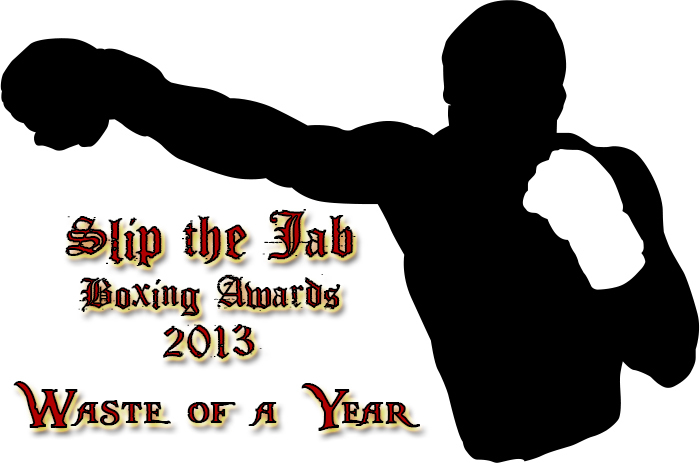 This entry was posted in Analysis, Boxing, Slip the Jab Boxing Awards, Slip the Jab Boxing Awards 2013 and tagged Analysis, Andre Dirrell, Andre Ward, billy Joe Saunders, Boxing, Boxing End of Year Awards, Boxing End of Year Awards 2013, Deontay Wilder, End of Year Awards, End of year Awards 2013, Frankie Gavin, Gary Russell Jr, Gennady Golovkin, Kell Brook, Omar Andres Narvaez, Peter Quillin, Robert Helenius, Sergio Martinez, Slip the Jab Awards, Slip the Jab Awards 2013, Tyson Fury, Waste of a Year by consortium11. Bookmark the permalink.